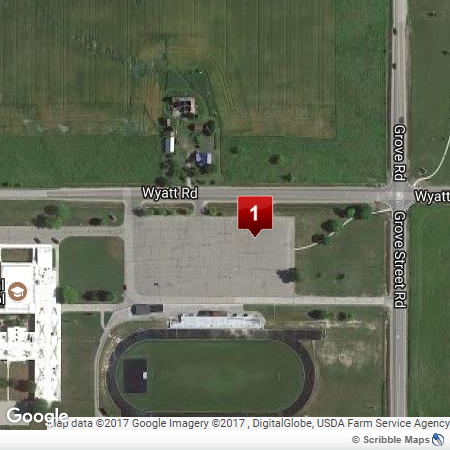 The King of the Road Driving Skills Road Test Site is located at east end of the Standish-Sterling Elementary (where the Middle School used to be) School parking lot and immediately north of the football field where you see the red marker #1 in the map below. The address is 3789 Wyatt Road; Standish, MI; 48658. When you come to Standish, be on US-23 (Main Street), and near the north end of town turn north onto Grove Road at the yellow caution light just to the east of the Standish Motel and Tacey's Twisty Freeze. If you are coming from the south, this is the second yellow caution light. It is about a two-minute drive from Standish to the testing location. Go to the only stop light in Standish. Head north on US-23 (Main Street) to Grove Road (where the blue box and white x is: it will be the second of two caution lights coming from the south), then turn north less than two miles to Standish-Sterling Middle School.